It was so gratifying on Thursday to see dad sitting up, eating, drinking, and talking a blue streak. I thought we were on the upward trajectory -- but maybe that's just not the way people recover, or maybe he is not out of the woods as I'd believed. While his vitals remain pretty good, and he kept his first few meals down, on Thursday night he started to have nausea. For the moment, he seems to be unable to eat, and he is weaker. I'm not sure how alert he is. For awhile I thought he was "out of it" but every so often he'll pipe in with a comment, barely audible, like "I have eight doctors." The number happens to be correct, because we counted (after he made the comment). None of us had done the math till he spoke up. He knows what sports games are happening every night. He keeps asking about where his wallet is, and did we cash a certain check. This is peppered in with a lot of delerious talk -- he talks to his brother who is not present, he points out a herd of deer over by the sink in the room, things like that. Sending more prayers for you, your Dad, and your family. These situations are hard on everyone. Cherish the time you have together and cement the memories in your heart and mind. I am sure you are doing the best for your Dad. Still sending good thoughts your way! 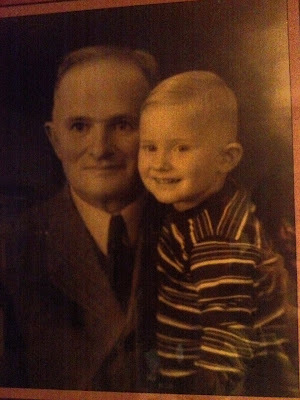 The picture of your dad with his grandfather is adorable. As for your dad's "lapses," he fell and suddenly his life is not the same. The medications may be making him see things (like deer by the sink). He is in very good hands and he is surrounded by people who love him. You are doing everything you can. Prayers your way.